Cost: Varies, depending on materials selected. Approximately $20-30 as shown. 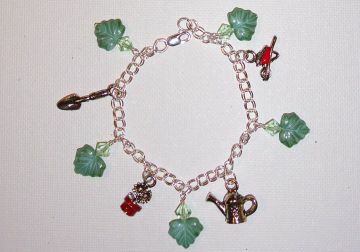 This easy garden charm bracelet can be made with any charms you like. Inspired by spring, I have selected a set of garden themed charms, and I had some nice leaf beads that I used with Swarovski crystal beads as accents. I used a pre-made charm link bracelet for this design which makes it super fast--just attach the charms and beads and you are done. 1 (pre-made) charm link bracelet. You can buy these at bead stores or craft stores, or also in the jewelry section of department stores. If you like, make your own bracelet with bulk link chain and a clasp of choice. I bought my charm bracelet at Auntie's Beads. 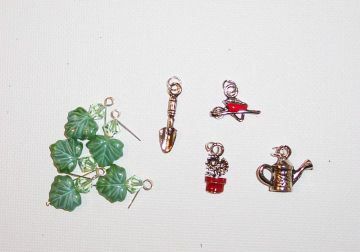 1 set of 4 garden charms. For this design, I purchased an inexpensive set of garden themed charms at my local Michael's craft store. You can also buy one charm at a time from any jewelry supply or department store. To save time, I prepare all my bead and charm components at the same time. I thread a leaf bead, then a Swarovski crystal bicone bead onto a headpin, and make a loop at the top with my round nose pliers. 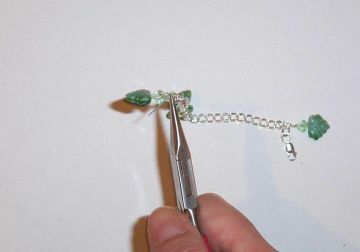 Using a basic wire wrap technique, I will attach each bead to the chain. Need help with this wire loop technique? Click here for instructions. Next, using a bead design board, or ruler (or just eyeball it! 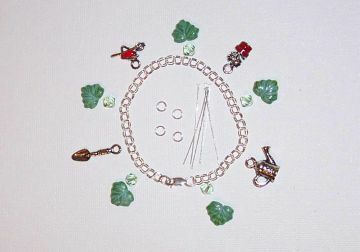 ), I determine where to place each charm and bead on the links of the charm bracelet. My charm set did not come with jump rings attached, so I also attach one jump ring to each charm. If you don't know how to use jump rings, click here for instructions. You can also use split rings if you prefer, for added security. Now attach each charm by looping it through a link in the chain, and closing the jump ring using your chain nose pliers. Attach each bead, alternating beads and charms in your design. Feel free to add more beads until you are happy with your bracelet design. That's it! 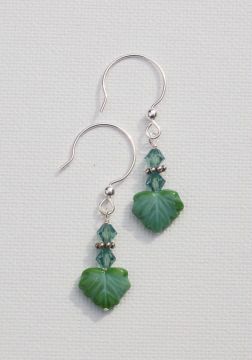 Try making these matching earrings for a complete set!